"Nahua" redirects here. For other uses, see Nahua (disambiguation). Christianity (Predominantly Roman Catholic), traditional Aztec religion is still practiced also. The Nahuas (/ˈnɑːwɑːz/) are a group of indigenous people of Mexico and El Salvador. Their Uto-Aztecan languages, Nahuatl and Pipil (Nawat), consist of many dialects, several of which are mutually unintelligible. About 1.5 million Nahuas speak Nahuatl and another million speak only Spanish. Less than 1,000 native speakers of Nahuatl remain in El Salvador. Evidence suggests the Nahua peoples originated in Aridoamerica, in regions of the present day northwestern Mexico. They split off from the other Uto-Aztecan speaking peoples and migrated into central Mexico around 500 CE. They settled in and around the Basin of Mexico and spread out to become the dominant people in central Mexico. The name Nahua is derived from the Nahuatl word-root nāhua- [ˈnaːwa-], which generally means "audible, intelligible, clear" with different derivations including "language" (hence nāhuat(i) [ˈnaːwat(i)] "to speak clearly" and nāhuatl [ˈnaːwat͡ɬ] both "something that makes an agreeble sound" and "someone who speaks well or speak one's own language"). It was used in contrast with popoloca [popoˈloka], "to speak unintelligibly" or "speak a foreign language". Another, related term is Nāhuatlācatl [naːwaˈt͡ɬaːkat͡ɬ] (singular) or Nāhuatlācah [naːwaˈt͡ɬaːkaʔ] (plural) literally "Nahuatl-speaking people". The Nahuas are also sometimes referred to as Aztecs. Using this term for the Nahuas has generally fallen out of favor in scholarship, though it is still used for the Aztec Empire. They have also been called Mēxihcatl [meːˈʃiʔkat͡ɬ] (singular), Mēxihcah [meːˈʃiʔkaʔ] (plural) or in Spanish Mexicano(s) [mexiˈkano(s)] "Mexicans", after the Mexica, the Nahua tribe which founded and predominated in the Aztec empire. At the turn of the 16th century, Nahua populations occupied territories ranging across modern-day Mexico, El Salvador, Guatemala and Nicaragua as far south as Panama. These were gradually assimilated into mestizo society in most places. The last of the southern Nahua populations are the Pipil of El Salvador. Nahuatl was a lingua franca for trade and rule during the apogee of the Aztec empire. There are many Nahuatl place names in regions where Nahuas were not the most populous group. Nahua populations in Mexico are centered in the middle of the country, with most speakers in the states of Puebla, Veracruz, Hidalgo, Guerrero and San Luis Potosí. But smaller populations are spread throughout the country, following recent population movements within Mexico. Within the last 50 years, Nahua populations have appeared in the United States, particularly in New York City, Los Angeles, and Houston. Archaeological, historical and linguistic evidence suggest that the Nahuas originally came from the deserts of northern Mexico (Aridoamerica) and migrated into central Mexico in several waves. Before the Nahuas entered Mesoamerica, they were probably living for a while in northwestern Mexico alongside the Cora and Huichol peoples. The first group of Nahuas to split from the main group were the Pochutec who went on to settle on the Pacific coast of Oaxaca possibly as early as 400 BCE. From c. 600 BCE the Nahua quickly rose to power in central Mexico and expanded into areas earlier occupied by Oto-Manguean, Totonacan and Huastec peoples. Through their integration in Mesoamerican the Mesoamerican cultural area the Nahuas adopted many cultural traits including maize agriculture and urbanism, religious practices including a ritual calendar of 260 days and the practice of human sacrifices and the construction of monumental architecture and the use of logographic writing. "Atlantean figures" from the Nahua culture of the Toltecs at Tula. Around 1000 CE the Toltec people, normally assumed to have been of Nahua ethnicity, established dominion over much of central Mexico which they ruled from Tollan Xicocotitlan. From this period on the Nahua were the dominant ethnic group in the Valley of Mexico and far beyond, and migrations kept coming in from the north. After the fall of Toltecs a period of large population movements followed and some Nahua groups such as the Pipil and Nicarao arrived as far south as Nicaragua. And in central Mexico different Nahua groups based in their different "Altepetl" city-states fought for political dominance. The Xochimilca, based in Xochimilco ruled an area south of Lake Texcoco; the Tepanecs ruled the area to the west and the Acolhua ruled an area to the east of the valley. One of the last of the Nahua migrations to arrive in the valley settled on an island in the Lake Texcoco and proceeded to subjugate the surrounding tribes. This group were the Mexica who during the next 300 years became the dominant ethnic group of Mesoamerica ruling from Tenochtitlan their island capital. Allying with the Tepanecs and Acolhua people of Texcoco they formed the Aztec empire spreading the political and linguistic influence of the Nahuas well into Central America. In 1519 an expedition of Spaniards sailing from Cuba under the leadership of Hernán Cortés arrived on the Mexican gulf coast near the Totonac city of Quiyahuiztlan. The Totonacs were one of the peoples that were politically subjugated by the Aztecs and word was immediately sent to the Aztec Emperor (in Nahuatl, Tlatoani) of Tenochtitlan Motecuhzoma II. Going inland the Spaniards encountered and fought with Totonac forces and Nahua forces from the independent Altepetl of Tlaxcallan. The Tlaxcaltecs were a Nahua group who had avoided being subjugated by the Aztecs. After being defeated in battle by the Spaniards, the Tlaxcalans entered into an alliance with Cortes that would be invaluable in the struggle against the Aztecs. The Spanish and Tlaxcaltec forces marched upon several cities that were under Aztec dominion and "liberated" them, before they arrived in the Aztec capital of Tenochtitlan. There they were welcomed as guests by Motecuhzoma II, but after a while they took the ruler prisoner. When the Aztec nobility realized that their ruler had been turned into a Spanish puppet they attacked the Spaniards and chased them out of the city. The Spaniards sought refuge in Tlaxcala where they regrouped and awaited reinforcements. During the next year they cooperated with large Tlaxcaltec armies and undertook a siege campaign resulting in the final fall of Tenochtitlan. After the fall of Tenochtitlan Spanish forces now also allied with the Aztecs to incorporate all the previous Aztec provinces into the realm of New Spain. New Spain was founded as a state under Spanish rule but where Nahua people were recognized as allies of the rulers and as such were granted privileges and a degree of independence that other indigenous peoples of the area did not enjoy. Recently historians such as Stephanie Wood and Matthew Restall have argued that the Nahua did not experience the conquest as something substantially different from the sort of ethnic conflicts that they were used to, and that in fact they may have at first interpreted it as a defeat of one Nahua group by another. With the arrival of the Spanish in Mesoamerica a new political situation ensued. The period has been extensively studied by historians, with Charles Gibson publishing a classic monograph entitled The Aztecs Under Spanish Rule. Historian James Lockhart built on that work, publishing The Nahuas After the Conquest in 1992. He divides the colonial history of the Nahua into three stages largely based on linguistic evidence in local-level Nahuatl sources, which he posits are an index of the degree of interaction between Spaniards and Nahuas and changes in Nahua culture. An overview of the Nahuas of colonial Central Mexico can be found in the Cambridge History of the Native Peoples of the Americas. The early period saw the first stages of the establishment of churches by mendicant friars in large and important Indian towns, the assertion of crown control over New Spain by the high court (Audiencia) and then the establishment of the viceroyalty, and the heyday of conqueror power over the indigenous via the encomienda. In the initial stage of the colonial period, contact between Spaniards and the indigenous populations was limited. It consisted mostly in the mendicants who sought to convert the population to Catholicism, and the reorganization of the indigenous tributary system to benefit individual Spaniards. The indigenous system of smaller settlements' paying tribute and rendering labor service to dominant political entities was transformed into the Encomienda system. Indigenous of particular towns paid tribute to a Spanish encomendero who was awarded the labor and tribute of that town. In this early period, the hereditary indigenous ruler or tlatoani and noblemen continued to hold power locally and were key to mobilizing tribute and labor for encomenderos. They also continued to hold titles from the pre-conquest period. Most willing accepted baptism so that records for this period show Nahua elites with Christian given names (indicating baptism) and many holding the Spanish noble title don. A set of censuses in alphabetic Nahuatl for the Cuernavaca region c. 1535 gives us a baseline for the impact of Spanish on Nahuatl, showing few Spanish loanwords taken into Nahuatl. As the Spaniards sought to extend their political dominance into the most remote corners of Mesoamerica, the Nahua accompanied them as auxiliaries. In the early colonial period, new Nahua settlements were made in northern Mexico and far south into Central America. Nahua forces often formed the bulk of the Spanish military expeditions that conquered other Mesoamerican peoples, such as the Maya, Zapotecs and Mixtecs. With the arrival of Christian missionaries, the first priority of the colonial authorities was eradicating indigenous religious practices, something they achieved by a combination of violence and threats of violence, and patient education. Nahua were baptized with Spanish names. The few Nahua who did not willingly abandon their religious practices were severely punished or executed. The Nahua, however, often incorporated pre-Christian practices and beliefs into the Christian religion without the authorities' noticing it. Often they kept practicing their own religion in the privacy of their homes, especially in rural areas where Spanish presence was almost completely lacking and the conversion process was slow. The Nahua quickly took the Latin alphabetic writing as their own. Within 20 years of the arrival of the Spanish, the Nahua were composing texts in their own language. In 1536 the first university of the Americas, the Colegio de Santa Cruz de Tlatelolco was inaugurated. It was established by the Franciscans whose aim was to educate young Nahua noblemen to be Catholic priests who were trilingual: literate in Spanish, Latin and Nahuatl. There are a large number of texts by and about Nahuas in this middle period and during this period Nahuatl absorbed a large number of loanwords from Spanish, particularly nouns for particular objects, indicating the closer contact between the European sphere and the indigenous. However, Nahuatl verbs and syntax show no evidence of the impact of Spanish contact. In the mid-sixteenth century, cultural change at the local level can be tracked through the production of Nahuatl alphabetic texts. The production of began a wide range of written documents in Nahuatl dates from this period, including legal documents for transactions (bills of sale), minutes of indigenous town council (cabildo) records, petitions to the crown, and others. Institutionally, indigenous town government shifted from the rule of the tlatoani and noblemen to the establishment of Spanish-style town councils (cabildos), with officers holding standard Spanish titles. A classic study of sixteenth-century Tlaxcala, the main ally of the Spaniards in the conquest of the Mexica, shows that much of the prehispanic structure continued into the colonial period. An important set of cabildo records in Nahuatl for Tlaxcala is extant and shows how local government functioned in for nearly a century. Regarding religion, by the mid- to late 16th century, even the most zealous mendicants of the first generation doubted the capacity of Nahua men to become Christian priests so that the Colegio de Santa Cruz de Tlatelolco ceased to function to that end and in 1555 Indians were barred from ordination to the priesthood. However, in local communities, stone-built church complexes continued to be built and elaborated, with murals in mixed indigenous-Spanish forms. Confraternities (cofradías) were established to support the celebrations of a particular Christian saint and functioned as burial societies for members. During this period, an expression of personal piety, the Church promoted the making of last wills and testaments, with many testators donating money to their local Church to say Masses for their souls. For individual Nahua men and women dictating a last will and testament to a local Nahua notary (escribano) became standard. These wills provide considerable information about individuals' residence, kin relations, and property ownership provides a window into social standing, differences between the sexes, and business practices at the local level. showing not only that literacy of some elite men in alphabetic writing in Nahuatl was a normal part of everyday life at the local level and that the notion of making a final will was expected, even for those who had little property. A number of studies in the tradition of what is now called the New Philology extensively use Nahuatl wills as a source. From the mid-seventeenth century to the achievement of independence in 1821, Nahuatl shows considerable impact from the European sphere and a full range of biligualism. Texts produced at the local level that in the late sixteenth and early seventeenth centuries were sometimes a mixture of pictorial and alphabetic forms of expression were now primarily alphabetic. In the late eighteenth century, there is evidence of text being written in "Nahuatlized Spanish", written by Nahuas who were now communicating in their own form of Spanish. Year-by-year accounts of major occurrences, a text known as an annal, no longer reference the prehispanic period. Local level documentation for individual Nahuas continued to be produced, in particular last wills and testaments, but they are much more simplified than those produced in the late sixteenth century. Nahuas began to produce an entirely new type of text, known as "primordial titles" or simply "titles" (títulos), that assert indigenous communities' rights to particular territory, often by recording local lore in an atemporal fashion. There is no known prehispanic precedent for this textual form and none appears before 1650. Several factors might be at work for the appearance of titles. One might be a resurgence of indigenous population after decades recovering from devastating epidemics when communities might have been less concerned with Spanish encroachment. Another might be the crown's push to regularize defective land titles via a process known as composición. The crown had mandated minimum land holdings for indigenous communities at 600 varas, in property that was known as the fundo legal, and to separate indigenous communities from Spanish lands by more than 1,100 varas. Towns were to have access to water, uplands for gathering firewood, and agricultural land, as well as common lands for pasturage. Despite these mandated legal protections for Indian towns, courts continued to find in favor of Spaniards and the rules about minimum holdings for Indian towns were ignored in practice. Labor arrangements between Nahuas and Spaniards were largely informal, rather than organized through the mainly defunct encomienda and the poorly functioning repartimiento. Spanish landed estates needed a secure labor force, often a mixture of a small group of permanent laborers and part-time or seasonal laborers drawn from nearby indigenous communities. Individual Indians made arrangements with estate owners rather than labor being mobilized via the community. The indigenous communities continued to function as political entities, but there was greater fragmentation of units as dependent villages (sujetos) of the main settlement (cabecera) sought full, independent status themselves. Indigenous officials were no longer necessarily noblemen. With the achievement of Mexican independence in 1821, the casta system, which divided the population into racial categories with differential rights, was eliminated and the term "Indian" (indio) was no longer used by government, although it continued to be used in daily speech. The creation of a republic in 1824 meant that Mexicans of all types were citizens rather than vassals of the crown. One important consequence for Nahuas and other indigenous was that documentation in the native languages generally ceased to be produced. Native towns did not cease to exist nor did indigenous populations speaking their own language, but the indigenous were far more marginalized in the post-independence period than during the colonial era. In the colonial era the crown had a paternalistic stance toward the Indians, in essence according them special rights, a fuero, and giving support to structures in indigenous towns and giving natives a level of protection against non-Indians. This can be seen in the establishment of the General Indian Court where Indian towns and individual Indians could sue those making incursions on their land and other abuses. These protections disappeared in the national period. One scholar has characterized the early national period of Nahuas and other indigenous "as the beginning of a systematic policy of cultural genocide and the increasing loss of native languages." Lack of official recognition and both economic and cultural pressures meant that most indigenous peoples in Central Mexico became more Europeanized and many became Spanish speakers. In nineteenth-century Mexico, the so-called "Indian Question" exercised politicians and intellectuals, who viewed the indigenous as backward, unassimilated to the Mexican nation, whose custom of communal rather than individual ownership of land was impediment to economic progress. Non-Indian landowners of estates had already encroached on indigenous ownership in the colonial era, but now liberal ideology sought to end communal protections on ownership with its emphasis on private property. Since land was the economic basis for Indians' ability to maintain a separate identity, land tenure became a central issue for liberal reformers. The liberal Reforma enshrined in the Constitution of 1857 mandated the breakup of corporate-owned property, therefore targeting indigenous communities and the Roman Catholic Church, which also had significant holdings. This measure affected all indigenous communities, including Nahuas, holding land. Liberal Benito Juárez, a Zapotec who became president of Mexico, was fully in support of laws to end corporate landholding. 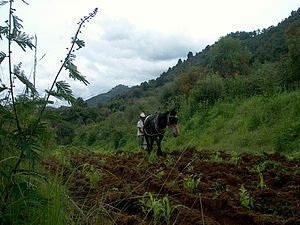 The outbreak of the Mexican Revolution in Morelos, which still had a significant Nahua population, was sparked by peasant resistance to the expansion of sugar estates. This was preceded in the nineteenth century by smaller indigenous revolts against encroachment, particularly during the civil war of the Reforma, foreign intervention, and a weak state following the exit of the French in 1867. A number of indigenous men had made a place for themselves in post-independence Mexico, the most prominent being Benito Juárez. But an important nineteenth-century figure of Nahua was Ignacio Manuel Altamirano (1834–93), born in Tixtla, Guerrero who became a well respected liberal intellectual, man of letters, politician, and diplomat. Altamirano was a fierce anticlerical politician, and was known for a period as "the Marat of the Radicals" and an admirer of the French Revolution. Altamirano, along with other liberals, saw universal primary public education as a key way to change Mexico, promoting for upward mobility. Altamirano's chief disciple in this view was Justo Sierra. Speakers over 5 years of age in the ten states with most speakers (2000 census). Absolute and relative numbers. The Mexican government does not categorize its citizens by ethnicity, but only by language. Statistical information recorded about the Nahua deals only with speakers of the Nahuatl language, although unknown numbers of people of Nahua ethnicity have abandoned the language and now speak only Spanish. Other Nahuas, though bilingual in Nahuatl and Spanish, seek to avoid widespread anti-indigenous discrimination by declining to self-identify as Nahua in INEGI's decennial census. Nor does the census count as indigenous children under 5 (estimated to be 11-12% of the indigenous population). An INI-Conepo report indicates the Mexican indigenous population is nearly 250% greater than that reported by INEGI. Across Mexico, Nahuatl is spoken by an estimated 1.4 million people, including some 190,000 who are monolingual. The state of Guerrero has the highest ratio of monolingual Nahuatl speakers, calculated at 24.8%, based on 2000 census figures. The proportion of monolinguals for most other states is less than 5%. The largest concentrations of Nahuatl speakers are found in the states of Puebla, Veracruz, Hidalgo, San Luis Potosí, and Guerrero. Significant populations are also found in México State, Morelos, and the Mexican Federal District, with smaller communities in Michoacán and Durango. Nahuatl was formerly spoken in the states of Jalisco and Colima, where it became extinct during the 20th century. As a result of internal migrations within the country, all Mexican states today have some isolated pockets and groups of Nahuatl speakers. The modern influx of Mexican workers and families into the United States has resulted in the establishment of a few small Nahuatl-speaking communities, particularly in New York and California. 64.3% of Nahuatl speakers are literate in Spanish compared with the national average of 97.5% for Spanish literacy. Male Nahuatl speakers have 9.8 years of education on average and women 10.1, compared with the 13.6 and 14.1 years that are the national averages for men and women, respectively. ^ "Nahua". Dictionary.com. 2012. Retrieved September 7, 2012. ^ "Did you know Pipil is critically endangered?". Endangered Languages. ^ Karttunen, Frances (1992). An analytical dictionary of Nahuatl. Norman: University of Oklahoma Press. pp. 156–157. ISBN 0806124210. ^ a b Kartunnen 1992, p. 157-158. ^ Kartunnen 1992, p. 203. ^ Kartunnen 1992, p. 145. ^ Sarah Cline, "Native Peoples of Colonial Central Mexico" in The Cambridge History of the Native Peoples of the Americas, Mesoamerica. Volume II, Part 2. Edited by Richard E.W. Adams and Murdo J. MacLeod. New York: Cambridge University Press 2000, p. 187. ^ Flores Farfán (2002, p.229). ^ Account of Bernal Diaz from Victors and Vanquished: Spanish and Nahua Views of the Conquest of Mexico. edited by Stuart Schwartz (Boston: Bedford/ St. Martin's, 2000). ^ Charles Gibson, The Aztecs Under Spanish Rule: A History of the Indians of the Valley of Mexico, 1519-1810. Stanford: Stanford University Press 1964. ^ James Lockhart, The Nahuas After the Conquest: A Social and Cultural History of the Indians of Central Mexico, Sixteenth Through Eighteenth Centuries. Stanford: Stanford University Press 1992. ^ Sarah Cline, "Native Peoples of Colonial Central Mexico" in Cambridge History of the Native Peoples of the Americas vol. II, Part II, Mesoamerica, 2000, pp. 187-222. ^ Robert Himmerich y Valencia, The Encomenderos of New Spain, Austin: University of Texas Press 1991. ^ Sarah Cline, The Book of Tributes: Sixteenth-Century Nahuatl Censuses from Morelos. Los Angeles: UCLA Latin American Center 1993. ^ Mathes, Michael, 1985, The Americas' first academic library Santa Cruz de Tlatelolco, Sacramento" California State Library. ^ Charles Gibson, Tlaxcala in the Sixteenth Century. New Haven: Yale University Press 1952. ^ James Lockhart, Frances Berdan, and Arthur J.O. Anderson. The Tlaxcalan Actas: A Compendium of the Records of the Records of the Cabildo of Tlaxcala, 1545-1627. Salt Lake City: University of Utah Press 1986. ^ Jeanette Favrot Peterson, The Paradise Garden Murals of Malinalco: Utopia and Empire in Sixteenth-Century Mexico. Austin: University of Texas Press 1993. ^ Frances Karttunen, "Nahuatl Literacy" in George A. Collier et al. eds. The Inca and Aztec States, pp. 395-417. New York: Academic Press. ^ S.L. Cline and Miguel León-Portilla, The Testaments of Culhuacan. Los Angeles: UCLA Latin American Center 1984. ^ S.L. Cline, Colonial Culhuacan, 1580-1600: The Social History of an Aztec Town. Albuquerque: University of New Mexico Press 1986. ^ Susan Kellogg, "Social Organization in Early Colonial Tenochtitlan-Tlatelolco: An Ethnohistorical Study." Ph.D. dissertation, University of Rochester. ^ James Lockhart, The Nahuas After the Conquest, Stanford: Stanford University Press 1992, p. 428. ^ Lockhart, The Nahuas After the Conquest, p. 428. ^ Lockhart, Nahuas After the Conquest, p. 450. Lockhart suggests that this might mark a "Stage 4" of language change. ^ a b Lockhart, Nahuas After the Conquest, p. 428. ^ Caterina Pizzigoni, The Life Within: Local Indigenous Society in Mexico's Toluca Valley, 1650-1800. Stanford University Press 2012. ^ Lockhart, Nahuas After the Conquest, pp. 410-11. ^ Charles Gibson, The Aztecs Under Spanish Rule. Stanford: Stanford University Press 1964, p. 285. ^ Gibson, The Aztecs Under Spanish Rule, p. 285. ^ Gibson, The Aztecs Under Spanish Rule, pp. 285-287. ^ Frans J. Schreyer, "Native Peoples of Central Mexico Since Independence" in The Cambridge History of the Native Peoples of the Americas, Richard N. Adams and Murdo MacLeod, eds. Vol. II, part 2, 2000, p. 229. ^ Sarah Cline, "Native Peoples of Colonial Central Mexico", p. 216-217. ^ a b Schreyer, "Native Peoples of Central Mexico Since Independence" p. 229. ^ Charles A. Hale, Mexican Liberalism in the Age of Mora, New Haven: Yale University Press 1968, 224-225. ^ Hale, Mexican Liberalism, p. 225. ^ Schreyer, "Native Peoples of Central Mexico Since Independence", p. 243. ^ Source: INEGI (2000). Percentages given are in comparison to the total population of the corresponding state. ^ Pablo Yanes (2008). "Diferentes y desiguales: Los indígenas urbanos en el Distrito Federal". In Rolando Cordera Campos; et al. Pobreza, desigualdad y exclusión social en la ciudad del siglo XXI (in Spanish). México: Siglo XXI Editores. p. 228. ISBN 978-607-3-00043-7. ^ Enrique Serrano Carreto; Arnulfo Embriz Osorio; Patricia Fernández Ham; et al. (2002). "Indicadores socioeconómicos de los pueblos indígenas de México, 2002" (in Spanish). Comisión Nacional para el Desarrollo de los Pueblos Indígenas. p. 82. Retrieved 22 December 2012. ^ "Perfil Sociodemografica de la Populacion Hablante de Nahuatl" (PDF). inegi.gob.mx. INEGI. 2000. p. 43. Archived from the original (PDF) on 2008-10-02. ^ Put another way, more than 95% of the Nahuatl-speaking population also speak at least one other language, most usually Spanish. See corresponding tables in INEGI (2000), p. 43. ^ "Perfil Sociodemografica de la Populacion Hablante de Nahuatl" (PDF). inegi.gob.mx. INEGI. Archived from the original (PDF) on 2008-10-02. Wikimedia Commons has media related to Nahua people. Canger, Una (1980). Five Studies Inspired by Náhuatl Verbs in -oa. Travaux du Cercle Linguistique de Copenhague, Vol. XIX. Copenhagen: The Linguistic Circle of Copenhagen; distributed by C.A. Reitzels Boghandel. ISBN 87-7421-254-0. OCLC 7276374. Canger, Una (1988). "Nahuatl dialectology: A survey and some suggestions". International Journal of American Linguistics. Chicago: University of Chicago Press. 54 (1): 28–72. doi:10.1086/466074. ISSN 0020-7071. Friedlander, Judith (1975). Being Indian in Hueyapan: A Study of Forced Identity in Contemporary Mexico. New York: Saint Martin's Press. Hill, Jane H.; Kenneth C. Hill (1986). Speaking Mexicano: Dynamics of Syncretic Language in Central Mexico. Tucson, AZ: University of Arizona Press. ISBN 0-8165-0898-4. OCLC 13126530. Kaufman, Terrence (2001). "The history of the Nawa language group from the earliest times to the sixteenth century: some initial results" (PDF) (Revised ed.). Project for the Documentation of the Languages of Mesoamerica. Retrieved 2007-10-07. Lockhart, James (1996). The Nahuas After the Conquest: A Social and Cultural History of the Indians of Central Mexico, Sixteenth Through Eighteenth Centuries. Stanford, CA: Stanford University Press. ISBN 0-8047-2317-6. OCLC 24283718. Restall, Matthew (2003). Seven Myths of the Spanish Conquest. Oxford and New York: Oxford University Press. ISBN 0-19-516077-0. OCLC 51022823. Sahagún, Bernardino de (1950–82) [ca. 1540–85]. Florentine Codex: General History of the Things of New Spain. vols. I-XII. Charles E. Dibble and Arthur J.O. Anderson (eds., trans., notes and illus.) (translation of Historia General de las Cosas de la Nueva España, 13 vols. in 12 hbk. ed.). Santa Fe, NM and Salt Lake City: School of American Research and the University of Utah Press. ISBN 0-87480-082-X. OCLC 276351. Suárez, Jorge A. (1983). The Mesoamerian Indian Languages. Cambridge Languages Surveys series. London: Cambridge University Press. ISBN 0-521-22834-4. Weaver, Muriel Porter (1993). The Aztecs, Maya, and Their Predecessors: Archaeology of Mesoamerica (3rd ed.). San Diego, CA: Academic Press. ISBN 0-01-263999-0.